Designer Theo Stewart-Stand offers a thoroughly modern, stainless steel update to the classic bi-fold wallet. Designer Theo Stewart-Stand offers a thoroughly modern update to the classic bi-fold wallet for men. This stainless steel wallet is extremely thin and flexible and has a silk like finish. This stylish accessory is light years ahead of the basic leather version, as it is composed of a dynamic material used in industrial sectors such as petroleum, medical, and aerospace. 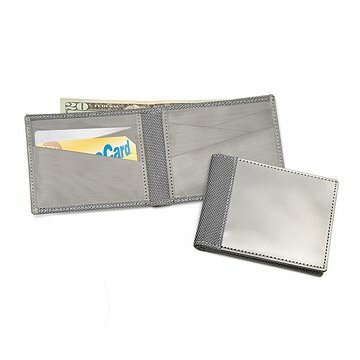 Plus, this stainless steel wallet blocks unauthorized transmission from RFID enabled credit cards & IDs. Each is packaged in a signature Stewart/Stand gift box. Wallet made in India and the packaging made in the USA. For optimal maintenance of this product, please do not exceed one card per credit card slot or pack it beyond capacity. Capacity: Capacity: 6 credit card slots, 2 extra slots, 1 billfold. My husband did not think there was enough space for all of his credit cards, license, insurance cards etc. My husband has long been looking for a slim, durable and stylish wallet and I finally found "The One". I only wish they made a briefcase out of the same fabric! Bought this wallet 8 years ago, still use it everday. Ive read on here about people saying this wallet isn't durable. Unless this is a knock off and I purchased the real deal, then that couldn't be farther from the truth. Im posting pictures of it after 8 years of everyday use. Awesome wallet, if mine does ever start to go I'll buy a replacement asap. But honestly I'd be surprised if I didn't get another 3 or 4 years out of this one. Good buy. My husband thought this was "really cool". It has 3 card pockets on each side. My husband usually jams two or three cards per slot. That doesn't really work with this wallet because stainless steel doesn't stretch. :) He's loving it and it made him pair down on what he carries. He's been carrying it for just over weeks now and it has started developing its patina which is also loves. Just know, it won't stay shiny silver like it comes in the box, but that's part of what makes it unique. He said he's gotten lots of comments on it too. was a little nervous as was a gift but he loves it! Bought for 20 something son who loved it. Only downside is its lack of a photo i.d. window. too slipery to get out of pocket. I am going to try to return it. My son gave it to my husband for Christmas. He has tried it for 2 days and it is a terrible wallet. He can't even get it out of his pocket and when he does he drops it. He threw the box out in the Christmas trash so we will see if they will take it back. My son really liked this product. States is thin enough to carry in pocket; durable product; really likes the stainless steel as it is unusual. I originally purchased this wallet as a Christmas present. My husband loved it! He travels quite a bit and particularly liked the idea that it thwarted identity theft. Unfortunately, he recently lost his wallet on a trip and is still looking for 'the' wallet as a replacement. Luckily, you had them in stock and our anniversary is just around the corner......I'm sure he will love the second one as much as the first. Purchased for my nephew. He loved it right away and has never seen a wallet like this before. Very positive reaction.